It was the perfect time to try something new and turn the mood around on an unremarkable, dull autumn evening. I had a table booked for a restaurant that’s anything but ordinary, set in the hearth of Fitzrovia. The place is called Lokhandwala, inspired by an affluent residential and commercial neighbourhood in Mumbai, suggesting both the Indian inspired tapas dishes and a backstory that I’m soon to discover. As I get there, the classic wood and glass store-front cannot prepare me for the world I’m about to step into. In a Colonial-themed setting I’m welcomed by a smell of scented sticks that for some reason makes me think of the smell of new books. Maybe because of the wooden decor or maybe because of the new setting depicting a centuries old scene. It all adds up a bit, the very studied deco, the mirrors and candles, the wooden chandeliers, all in earth tone colours with discrete gold writing here and there. I’m here to try out Lokhandwala’s healthy dishes but I soon forget what my visit is all about as my senses are invaded by a curiosity to look around, to touch, to smell, to let myself transported in this place. There’s a couple seated right by the large window and as they are taking their photos I’m convinced this a great place to take your partner for a special dinner or just a breakaway from the everyday. Also, for those that are bored by same rainbow colour theme, Lokhandwala does offer a unique setup for photos. I snap out of it and start thinking about the food. 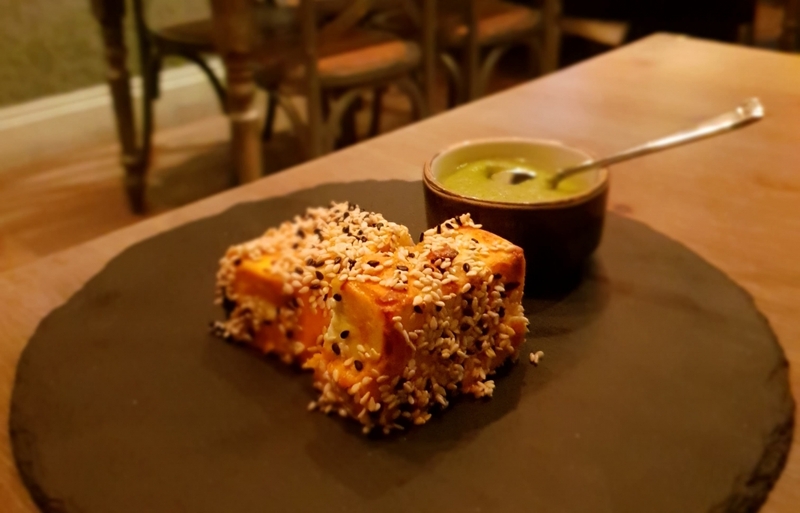 Starter: Til e Paneer – White and black sesame crusted cottage cheese with apricot filling. The menu description is quite accurate and revealing. This cheese speciality could just as well be a desert, with it’s sweet taste and crunchy exterior. However it’s just enough cooked to give it that special taste and get me in the mood for dinner. The apricot interior makes for a mix just like in a cocktail, contrasting both in taste and texture. And if the mix is not enough there’s enough mint sauce on the side to get my taste buds all excited. Cottage cheese is a low-calorie cheese with a mild flavour, being considered a fresh cheese when compared to other aged cheeses. It’s quite protein rich, with it’s only real downside being the generally high sodium contents. Consumed in reasonable quantities, like this starter, it can be a good source of protein and other goodies like B12, riboflavin and calcium. The apricot filling is mostly a tasty addition, not in quantities that would seriously impact the overall nutrients of the meal. Even so, it’s sweetness could be an igniter for insulin production so I would avoid spiking it up, further on in my meal. Besides providing the crunchy exterior, the sesame seeds are a notable source of nutrients, like protein, iron, zinc, copper, vitamin E, thiamin, calcium, magnesium, and manganese, the list goes on. About half the seed is fat, mostly unsaturated, no worries there. The sauce is very minty, the cook did not shy at using the rich taste of the fresh leaves. There’s lots of praise about the benefits of mint. It is thought to increase bile secretion and encourage bile flow, which helps to speed and ease digestion. While browsing the menu for my main course I come across the story of Lady Charlotte Louisa Fitzrovia, the inspiration for the restaurant’s theme. A timeless love story set in immemorial times, that I won’t spoil for you, find the details in the menu. Main: Banana Wrapped Fish – Tomato sour crusted sea bass cooked in banana leaf. Again, the menu is descriptive and clear. Even so, I wasn’t exactly sure what to expect from the banana leaf cooking. I was about to find out that the leaf is not there just for deco and it does leave it’s own mark on the taste. I find it hard to describe the specific taste, you’ll just have to come and try it for yourself. The dish is flavoursome but uncomplicated, with few ingredients and a taste that I find unique. The sea bass serving is low in calories and an excellent source of protein, selenium and essential omega-3 fatty acids. Unfortunately nowadays almost all fish contain trace amounts of mercury. For most people, the small amounts do not pose a health problem but pregnant women and children should limit the amount they eat if not avoid it altogether. The tomato sauce comes at just the right amount, and I would consider it a healthy option if compared to other sauces that go with fish in general. Overall the main has the elements that I would consider good food, few ingredients, lots of flavour in a nutritiously correct combination. Just squeeze some of the lemon on top and you’re good to go! My visit at Lokhandwala sure got me out of my day to day, and confirmed once again that healthy options can step out of the well known and ordinary.